Ever wonder what modalities other independent eye care professionals are prescribing for keratoconus patients? Or, how often keratoconus patients are experiencing annoyances with their contact lenses? How often a keratoconus patient switches contact lens brands? What percentage of independent eye care professionals are interested in offering products only available to independent eye care professionals? 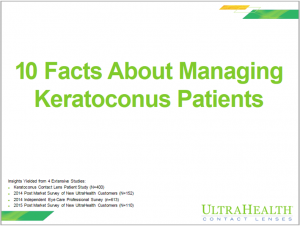 Ten Facts about Managing Keratoconus Patients provides information from three different market research studies and shares best practices from other independent eye care professionals.